Last November, our community was hit with a tragedy: a gas explosion that damaged many of our beloved small businesses. Our town was heartbroken to see so many of our small businesses broken, but was uplifted by the many people who immediately jumped in to begin fixing the damage. Since then, we’ve been working together to rebuild our shops, and help support each other through the process. 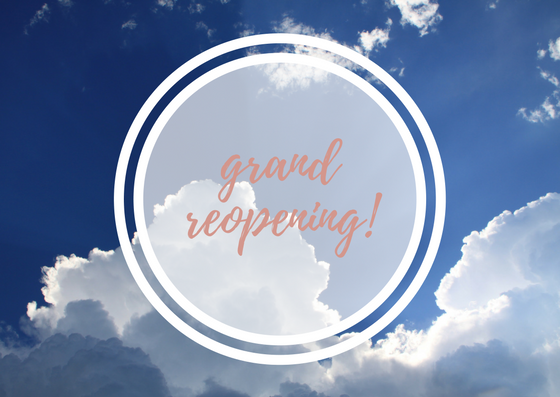 After months of hard work, we’re ready to officially reopen our beautiful downtown! We’d love for you all to join us for our grand reopening of downtown Canton, Saturday, May 13th, in Jones Park! Festivities start at 10 a.m.! We’ll have a ceremonial ribbon cutting, presentations and recognition for those who helped in the aftermath, special discounts at downtown businesses, free trolley rides, music, and much more! We’ll also be announcing our very lucky Canton Cash winners. Enjoy coupons to use throughout the day at businesses and restaurants. We hope you come join Crawford’s Home Furnishings, along with our fellow local businesses, to help celebrate and recognize all the hard work, time, and money that organizations, individuals, and fellow businesses put into bringing our downtown back to life. Without you, the aftermath would have been harder to get through. Crawford’s Home Furnishings has been a local, family-owned business in Canton since the 70’s. We have grown considerably through the years, starting as a flooring installation business and growing into a retail store specializing in flooring, and offering expert products and advice in paint & stain, counter tops, home furnishings, window treatments, mattresses, accent pieces and everything in between for home projects and updates. We carry exclusive name brands including Benjamin Moore, Hunter Douglas, Cambria, Lane Furniture and Mohawk Flooring. Crawford’s Home Furnishings loves their customers which is why we offer free pickup and delivery within a 50 mile radius of Canton. Our store hours are Monday-Friday: 8am-5pm and Saturday: 8am-4pm. Visit our store during the grand reopening to find the perfect look for your home, or just to say hello. Crawford’s Home Furnishings cannot express the love and pride we feel for Canton after the amount of positivity, goodwill and help the community offered during its time of difficulty. Our entire Crawford’s Home Furnishings family thanks you!